We want to feature your expertise on our website. With an audience of more than 2 million people from around the world, we provide the ideal platform for businesses seeking to highlight their market leadership, get in front of an engaged audience, and boost their brand reputation. Get the most out of writing for Clutch by choosing one of our two contributed content opportunities. Each opportunity provides benefits that vary in publication timing, editing/writing assistance, and promotion frequency. Receive priority publication, additional promotion, and extra writing assistance to feature your thought leadership and company's expertise. Read our full writer’s guidelines before applying to write for us. The following are key requirements, not suggestions. If you don't follow them, your contribution will not be published. We require an outline of your proposed topic in our application form and links to previous writing samples. We will let you know within a week if the article you suggest is suitable. If you don’t hear from us, your application was not accepted. Please do not submit a full article until you hear from us. Want to write for us again? Apply again! You must apply every time you want to submit an article topic. We review each pitch and reach out within one week if the topic sounds like a good fit for our audience. If you don't hear back from us within a week, your piece isn't the right fit for us at this time. 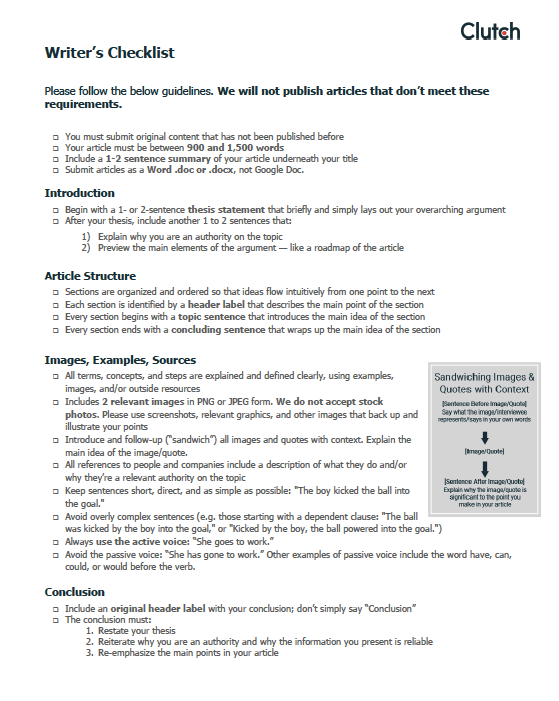 After receiving a completed free article, we take about one month to review it and share feedback. We share feedback on premium articles within two weeks. We expect writers to update their article based on our feedback before publication. Once articles are finalized and approved, we take about two to three months to publish free articles. We publish premium articles within two weeks of approval. We use our "Writer's Checklist" (below) to edit articles. Please ensure that your completed article includes every item on the checklist before submitting it. We reserve the right to reject articles that do not meet our requirements and edit articles as we see fit. Please read these guidelines carefully if you want to contribute content. We feature articles that help readers make informed business decisions. We require detailed explanations, concrete examples, and actionable instructions. A reader shouldn’t have to look up another source when reading your article. Inform readers about business processes, challenges, scenarios, and tools, using case studies, examples, and data. Educate readers about the choices they need to make to innovate and enhance their business and why. Guide readers through the process of solving pressing business challenges and making informed decisions, using clearly written, step-by-step instructions and compelling, reader-friendly visuals. Cover a topic comprehensively so readers don't need to read anything else before taking action. To get an idea of what we're looking for, check out articles we've published. Why should you do X? What is X? Why is X important? We use this writer's checklist as our editing handbook. Please ensure that your completed article includes every item and meets each requirement before submitting it. Reach out to [email protected] with any questions about joining our content community. We look forward to working with you!